Google Instant may let you search the Web at warp speed, but the debate rages on about whether the new search technology is good for users and Website owners. Some fear that Instant makes it harder to find content on controversial topics, Opera users are left out the Instant party (for now), some of Google's favorite features are being summarily dumped because of Instant, and Search Engine Optimization wizards can't decide whether Instant is good or bad for them. Google Instant shows you a full page of search results that changes while you're still typing your query. Google Instant is also supposed to be personalized to your location, and suggests search queries as you type to help you find things faster. When you try typing controversial or potentially offensive terms using Google Instant, the search giant errs on the side of caution and shows you nothing. Type in the letters f-u-c, for example, and instead of a full page of search results you get a blank white screen. Other blacklisted words, such as suicide, will push searchers to less controversial topics that include the same word instead of showing a blank white screen. This practice is already alarming at least one person working in suicide prevention, according to a blog post by Lauren Weinstein, co-founder of People for Internet Responsibility. When you type "suicide" into Google Instant, the first page of results are largely dedicated to a company called SuicideDoors.com, an automotive parts supplier. Hit the space bar, and you are directed to results for the band Suicide Silence. The concern is that when someone is searching for information about suicide, it would be preferable to have health-related information appear as soon as possible. In fact, when you press Enter or the "Search" button in Google, that's exactly what you get. But with Google Instant a search for suicide could become more confusing for the user, especially if that person is distressed--either for themselves or a loved one. Google's blacklisting word makes a lot of sense for a lot of controversial terms, but it can also have unintended consequences for words less frivolous than f-u-#-%. Google Instant is designed for many modern Web browsers, including the most recent versions of Google's Chrome, Mozilla Firefox, Microsoft's Internet Explorer, and Apple's Safari. But Opera users are out of luck for the moment -- officially, anyway. To turn on Google Instant in Opera go to Google.com and right click anywhere on the page, and select "Edit site preferences" from the menu. 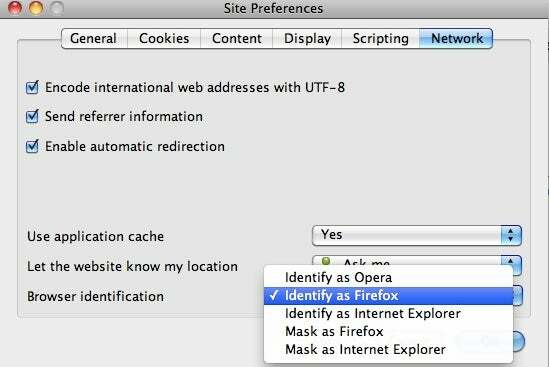 When the pop-up window appears click on Network, and down at the bottom select "Identify as Firefox." Click OK, refresh your browser and you're all set to start using Google Instant. The Choose Opera blog says this trick will work to view Google Doodles as well. The Google-focused blog Google Operating System has a long list of search features that have been retired thanks to Google Instant. If you scroll through the first page of Google Instant results you'll notice the search box at the bottom of the page is gone. That's not such a bad thing, since Google Instant is limited to ten results anyway, meaning it's a short scroll back to the top of the page. Nevertheless, I have found the bottom search box handy on many occasions. If you press enter or the "Search" button, you will still see the old search box. Google Suggest will also no longer show your previously typed searches when using Instant. Losing easy access to your prior searches is an unfortunate downside of Google Instant. GOS points to a blog post by Google employee Mat Cutts that says on average "40% of [your] searches on any given day are repeat searches." Death of Keyword Search Optimization? The advent of Google Instant has many wondering what the impact will be on Search Engine Optimization, and on the consulting firms specializing in this practice. SEO is meant to help Websites gain traffic based on optimizing site content for commonly used keyword searches related to that Website. Searches for flower delivery site FTD.com, for example, would focus on words such as flowers, floral, delivery, bouquet, and so on. It's hard to know if SEO is ultimately a good or bad thing for regular users. SEO-focused content companies such as Demand Media often rank high in search results, but lack substantially useful content. But SEO also makes it easier for lots of good content to rise to the surface, thanks to some carefully placed keywords. "Google Instant means no one will see the same web anymore, making optimizing it [with SEO] virtually impossible," says Steve Rubel, a blogger and director of insights at Edelman, a public relations firm. Search Engine Land's Danny Sullivan disagrees, saying that SEO is not dead, and that "Google Instant reemphasizes the need to do keyword research" instead. But if Google Instant means people are using more of Google's keyword suggestions and fewer of their own queries, that means there are less search keywords to fight over. SEO firm Semetrical says that could be bad for the future of SEO. "[Google Instant]...will make SEO much harder as we all have to start fighting over [a] few phrases." Let us know your thoughts on Google Instant below.